As people rushed to purchase a Raspberry Pi , many users developed additional circuit boards to support new applications. These user-created boards range from the simple to the complex, and many of the boards are now produced for the general public. Companies have also gotten into the game of developing add-ons for the Raspberry Pi. As a result, solutions exist for almost every task, including a camera module that functions via sensors, control boards that assist with home automation, and even small sound cards. In this article, I look at some of the more popular and interesting add-ons, many of which can be purchased from sta ndard electronics stores (see Table 1 for an overview). Typically, hardware extensions are attached to the GPIO pins of the Raspberry Pi. Users connect the boards either with a flat ribbon cable or put the extensions directly on the Rasp Pi. The results give the appearance of a hardware sandwich. The Raspberry Pi Foundation even offers specifications for these kind of piggyback boards . The specifications prescribe the use of an EEPROM chip for communicating how an extension uses the GPIO pins and the type of hardware that is on the board. An extension that adheres to these specifications is called Hardware Attached on Top, abbreviated as HAT. However, a specification is only intended to be a recommendation. 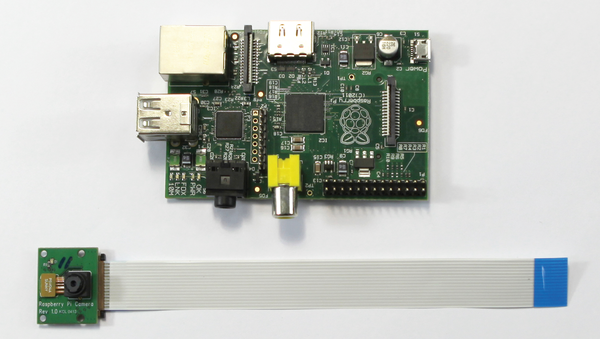 Therefore, even if a manufacturer advertises a Raspberry Pi extension as a HAT extension, it does not necessarily have to comply with the Foundations's specifications. The Raspberry Pi Foundation itself has contributed one of the best-loved extensions. This is the official camera module (Figure 1), which can shoot images at 5Mpx and record videos with a resolution of 1080p30, 720p60, and VGA90 . Access to the camera exists via the command-line tools (raspistill or raspivid), Video4Linux (V4L), or a corresponding library. Users connect the camera with a flat ribbon cable to the Camera Serial Interface (CSI) port of the Raspberry Pi. The module costs just under EUR27/$30. For an additional EUR3, you can purchase a version of the camera module that is capable of capturing infrared radiation  and night-time images.